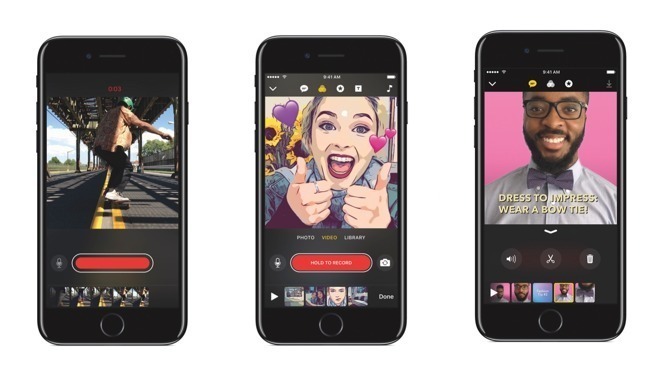 Apple updated its new Clips video editing app on Wednesday, bringing a few user interface improvements like easier Live Title editing and automated sharing suggestions to the social media sharing tool. With Clips version 1.0.1, users can now edit Live Title text by tapping on the graphical asset while a video is playing or paused, according to Apple's release notes. Previously, users were required to pause video to edit Live Title text. Today's update also introduces new functionality that streamlines the sharing process. Specifically, Clips will now suggest frequently used addresses when sending a finished video to multiple contacts, a useful feature for direct group messaging. Finally, Apple promises improved stability and reliability when recording video clips and sharing videos that contain certain posters. Similar to Live Title text, posters are full-screen text-based animated images that serve as title cards when placed between clips. Clips was introduced for iPhone and iPad in April as an Apple-designed alternative to social media creation tools made popular by companies like Snap and Instagram. The first-party title boasts a range of tools and powerful editing features that allow users to stitch together content of up to 60 minutes in length. Like other offerings, Clips comes with filters and emoji support, as well as Live Title text, the latter of which uses iOS technology to translate voice input into speech. Along with saving video creations to Photos, Clips uses share sheets to send content to social networking services like Facebook and YouTube. For more information, check out AppleInsider's first look at Clips, which walks through the creation of a short video. Clips is a free 49.3MB download from the iOS App Store.